As incumbent Wisconsin Gov. Scott Walker seeks reelection to a third term, he may be in for a rough road ahead that reflects the GOP’s struggle to hold onto its identity in the age of President Donald Trump. In fact, a new NBC News/Marist poll shows Tony Evers, the state superintendent of schools who’s poised to win the August 14 Democratic primary, leading Walker, a Republican, by 13 points in what’s bound to be a competitive race. After surviving a 2012 recall election and a failed 2016 presidential run, Walker has attempted to appeal to both Trump supporters and moderate voters -- an approach that may cost him reelection this fall. 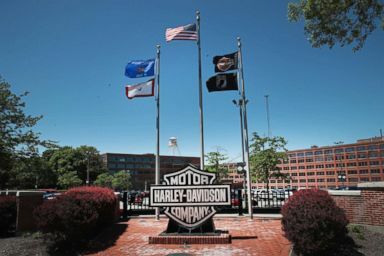 Flags fly in front of the headquarters of iconic American motorcycle builder Harley-Davidson on June 1, 2018 in Milwaukee, Wis. The Badger State has been hit hard by Trump’s tariffs on aluminum and steel imports, which led Milwaukee-based motorcycle manufacturer Harley-Davidson to outsource production overseas in June -- a move the president heavily criticized -- while the state’s dairy farmers struggle to combat retaliatory tariffs in what appears to be an intensifying trade war. “The Chinese and the European Union are making it more difficult for Wisconsin firms to sell new products. 90% of products from our state’s dairy industry go overseas,” Evers told ABC News. After endorsing Trump in the 2016 election, Walker “respectfully asked” the president to “reconsider” his position on the tariffs. 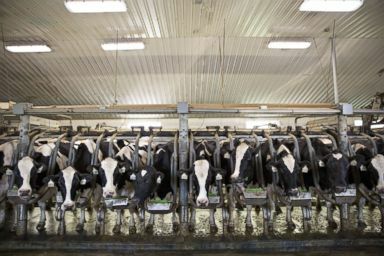 Cows stand in the milking parlour at the Lake Breeze Dairy farm in Malone, Wisc. on May 31, 2016. "If the President wants to protect good-paying, family-supporting jobs in America, especially here in Wisconsin, then he should reconsider the administration's position on these tariffs, particularly on ultra-thin aluminum,” Walker said in a March press release. Since then, he’s praised Trump’s efforts to bring manufacturing jobs to the U.S., and appeared alongside the president at the June groundbreaking of a new Foxconn plant in Wisconsin. "Foxconn will earn tax credits based on actual investment in job creation. No jobs and investment? No credits," Walker says in a new series of ads released Tuesday touting the Foxconn deal. Despite Walker’s support for the Foxconn deal popularized by Trump, Evers believes the president’s rhetoric on trade is “already negatively impacting” manufacturers and that Walker is doing little to stop it. In another show of solidarity, Trump signed off on the governor’s plan to lower Obamacare premiums on Sunday. Let’s be clear: Obamacare is collapsing. Washington failed to act, so Wisconsin is leading yet again. Our bipartisan plan got approval from the Trump Administration and now we’re going to help drive down premiums, increase choices & improve health care! But critics have called Walker’s plan an election-year move to help him score points on health care after repeatedly trying to dismantle Obamacare during his past two terms. Republican presidential nominee Donald Trump is welcomed to the stage by Wisconsin Governor Scott Walker during a campaign rally at the W.L. Zorn Arena, Nov. 1, 2016 in Altoona, Wisc. Walker’s approach to education also resonates with the Trump administration. Since taking office, he’s gutted collective bargaining rights of public employee unions and given school districts more control over funding. “Gov. Walker remains focused on achieving real results for Wisconsin’s families by investing record actual dollars into our classrooms,” Altenburg told ABC News in a statement. Recently, Walker released a series of ads touting his support for education, including one featuring the rural Three Lakes School District in northern Wisconsin. “The most ironic, egregious, and hypocritical thing about this ad is that this school district had to ask for $15 million in a referendum to voters just to keep its doors open last fall,” Helmstetter said. 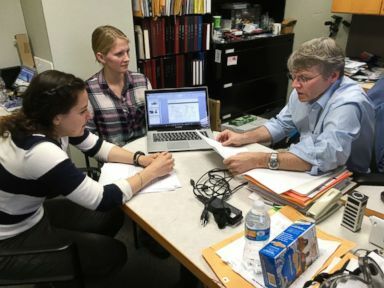 University of Wisconsin-Madison chemistry professor Robert Hamers confers with junior Alice Horein and doctoral candidate Sarah Guillot on their research projects during a meeting on campus on March 6, 2017. Evers acknowledged Walker’s recent move to raise educational funding, but attributed the increase to Evers's own budget. “That’s why there was an increase -- because [Walker] adopted my budget. That was a step in the right direction,” Evers said. “While Scott Walker is delivering real results for hard-working Wisconsin families, Madison Bureaucrat Tony Evers can’t even competently run his own agency,” Wisconsin Republican Party spokesperson Alec Zimmerman told ABC News in a statement. While Trump hasn’t officially endorsed Walker just yet, Evers hopes voters will see through what appears to be a growing Trump-Walker alliance. “People make decisions based on what Donald Trump says. 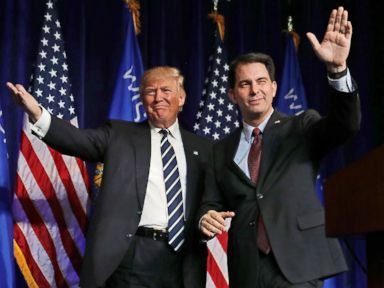 But I don’t think Trump’s [potential] endorsement will help Walker at all,” he said.